It became once more clear to me that protesting here is a lively business. 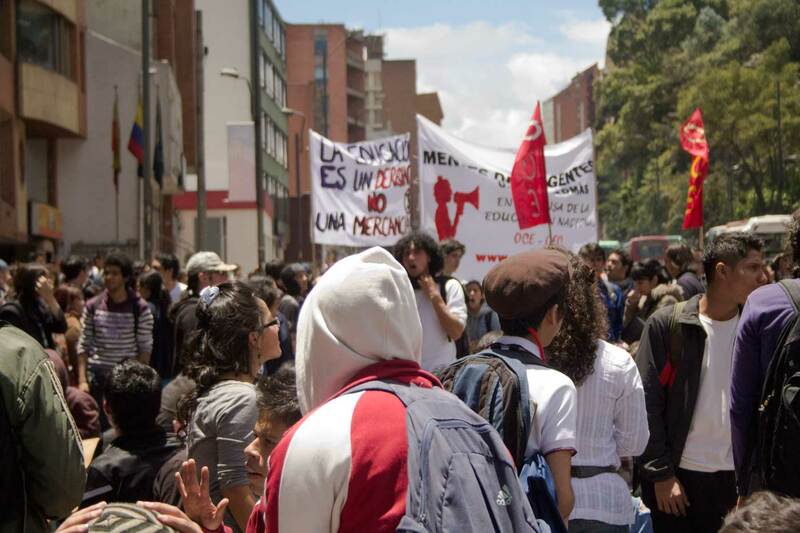 This friday, there was another intervention on the streets of Bogota organized by the students of several universities to remember Nydia Erika Bautista. Latter was part of a student organization called M19 in he 80´s, which at that time was still known as guerilla insurgent movement. During that period, many people have disappeared without judicial orders, under which Nydia Erika Bautista who was tortured, raped and eventually murdered. 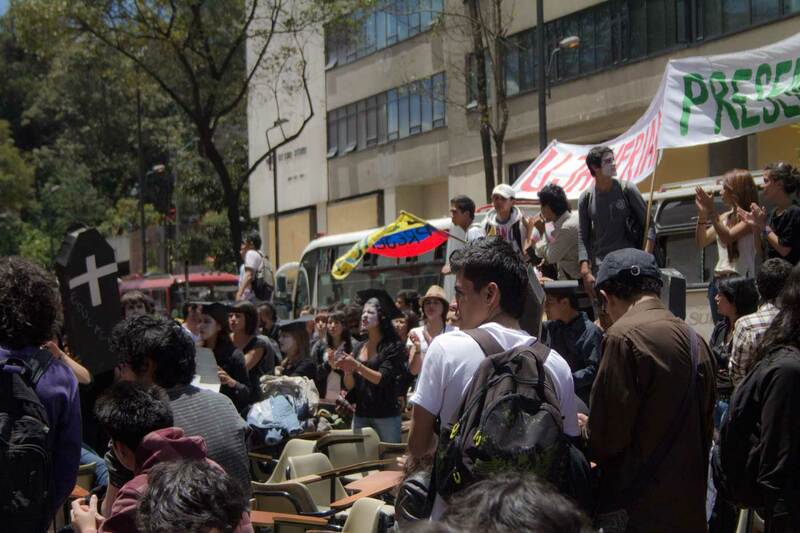 The 3rd, 4th, and 5th of may, students from several universities gathered to remember the cruel actions of the state and protest against more impunity. Antena Mutante was there as well to support the students technically and audiovisually. As well did I see many of the people that I met during other interventions, such as Diego, from Desarme and Esteban, whom I met through Antena Mutante and is involved in working with political prisoners in Bogota. More and more do I see how this small group of like minded people appeal to each other to make these interventions reality. 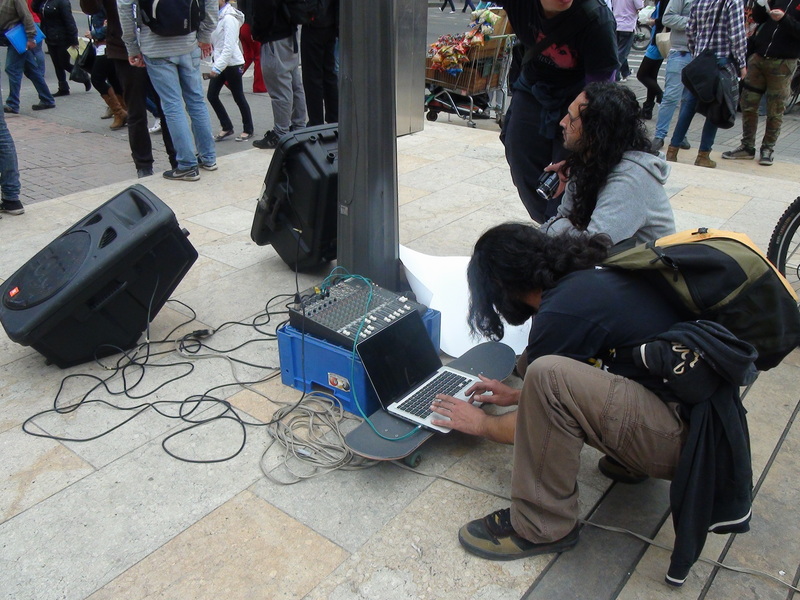 Erik and Diego made provided for the speakers, Ali the laptop and cables for music and everyone else that was there helped carrying, connecting and transmitting untill every passant tuned his or her head. 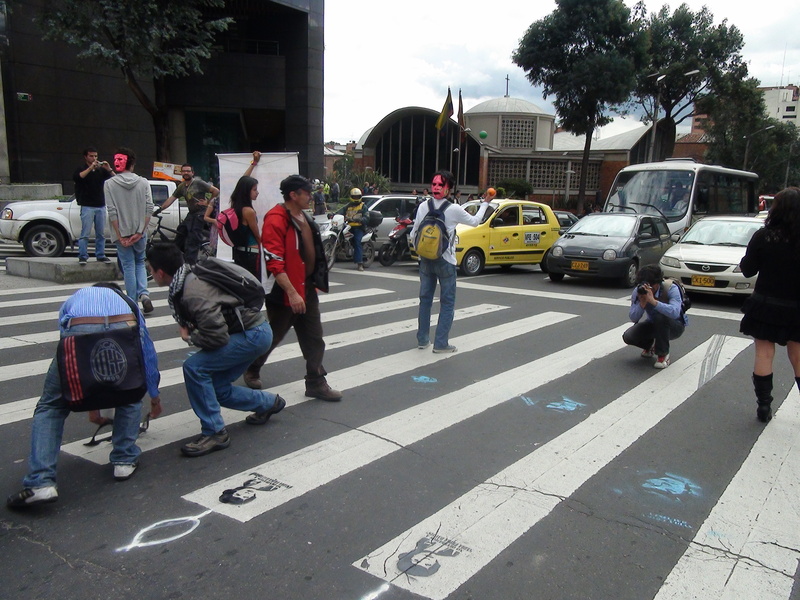 In the next video, the students ´reclaim´ the streets with music and humor which drew a lot of attention from the bystanders. Police was present, but did not interfere and all the actions were allowed to the extent that it did not completely disturb the traffic. I doubt whether such action would be permitted in Holland, but time of mass protest and activism often just seems far away. People complain, but don´t do much about it and there remains a mentality of: ¨someone else will fix it¨. In that respect we can learn from whatever happens here, the creativity of the protests and the way people still believe in change. Escratche Street Intervention from Fei An Tjan on Vimeo. A week has gone by since I’ve been in Bogota, and I can’t use another word than chaos. Everything is chaos, the house I lived in the past few days, the weather, the streets and above all, the traffic! I forgot again how zebras never work in South America and that cyclists never get priority over honking cars. On top of that, Bogota built the Transmilenio which was supposed to be a new, better and improved network of buses, but what in reality turns out too be yet another disaster. And then, suddenly, there was silence. On Carrera 7, one of the bigger streets that runs through the city, where you normally can’t even see the other side of the street due to cars and smog, you could suddenly hear the birds whistling (those who didn’t die from co2). A student organization was the reason of the silence and ‘reclaim the streets’ was the first thing that went through my head. I couldn’t help it, but if you’re 24/7 behind your laptop, there’s little other to think of than: ‘thesis, thesis, thesis’. The students were protesting against the privatization of the universities, which would make education even less affordable and the gap between poor and rich even bigger. To me, it seemed interesting that they were allowed to protest on such an important way through the city while the demonstration was relatively small. Although the main idea of the students was maybe not to oppose capitalism and the car as its main mode of transportation, it indirectly added to this debate. After reading both Soja and Sassen I started thinking of how to frame this manifestation spatially, where the students would ”take the control over the production of our lived spaces.” Even though they might not reach the effect to stop the privatization of the university, the effects of this couple hours intervention of the street, at least to me and I bet to many drivers with me, was tangible. I am starting to get the concept of the Antena Mutante more and more, in a city of control as big as Bogota, it is the little things that matter. And maybe all the localities can eventually indeed form a more global multiplicity. Viva la Resistencia! Edward Soja. Thirdspace: Journeys to Los Angeles and Other Real-and-imagined Places. (Cambridge, MA: Blackwell, 1996. On December 8th, both Ellen and I went to the last session of the Hivos Digital Natives with a Cause Thinkathon in The Hague. On arrival we were welcomed in an artistic environment where post-its were connected by ribbons and in that way represented the connections. People were invited to write up little messages in a ‘tweet like’ way and stick them all over the room. This created a colorful and amusing activity while waiting for the debate to start. The second project discussed was by Jasmine Patheja on the Blank Noise project. This one in particular got my interest as it treated a problem, which to me, seems rather hard to address in a Machismo society such as India. The Blank Noise project would photograph men who had committed some sort of street sexual harassment, also called Eve Teasing. Not in the worst sense of the word, but Jasmine commented on some of her personal experiences which are, I think quite recognizable for every woman. It wasn’t only about men groping or touching you, but also about gazing, staring, calling names and capturing that on camera. Interesting was the power switch she described, once she started photographing these men, but unfortunately she did not elaborate on this much more. If it would already raise some sort of awareness in these men’s minds, Blank Noise has according to me already accomplished quite a fair deal. What I particularly liked about it was that the project captured a problem that is very common in (Indian) society, but has apparently evolved this far, in that it became normality. Blank noise succeeded in giving this problem a face. Later that evening we would all join a very fine dinner in one of the Hague’s art spaces. An inspiring location where I met Colombian/Norwegian lecturer Álvaro Ramírez. After a long talk over dinner, I suddenly saw myself walking away with the second project to visit in Colombia called Hiperbarrio.org. This is a project from Ramírez which he set up in and around smaller villages of Medellín. Because of the difficult situation in these areas with government, guerillas and paramilitaries around, Ramirez though of a way in which the local people could give voice to these problems. The result was Hiperbarrio.org which is written in both English and Dutch and seemed to me everything but slacktivism. At 22.00 I left the Hivos event with a thrilling feeling that my thesis was getting some shape….